Soni is a thirty-eight-year-old mother of ten who lives with her children and husband, Sadla, in the Sadla Surjho village of Sujawal district in Sindh. Her husband and eldest son together earn a total income of PKR 8000 (Approx. 65 USD) through local farming. Meeting the needs of all of her children and running the house with just PKR 8000 a month was always a challenge for Soni. She was always struggling to complete the month with the finances she was handed; there was never enough food and health expenses were often sidelined. Traveling to Daro city, to avail even the most minor health assistance would cost money which made it nearly impossible for Soni or any of her family members to consider. Very little or no money was saved for healthcare in our house. My youngest son who is two-years-old now was very weak since infancy. He could hardly walk. He did not eat well and was thus very thin. I then decided to take him to a clinic in Daro city to consult a doctor about his decreasing weight and health. The hour’s travel to Daro city alone cost us PKR 1500 each time. Yet, for a year we kept taking him to the doctor in Daro regularly, but his health did not improve, nor did he start working. This kept me extremely worried, shared Soni. Early this year some women from Lakhano Surjho, a nearby village, told Soni about the MNCHⁱ centre operating in Ranta village, which is a half an hour walk from Soni’s home village. They shared their good experiences with the health staff at the centre and assured Soni that the medical support provided there has been effective and consistent. The MNCH is only near my home. I first visited the health centre in June, 2018. The medical officer at the centre diagnosed my son with anemia. His weight was only 4kgs when he first visited the MCNH, narrated Soni. The doctor at the MNCH prescribed iron tablets to my son and in addition provided a diet chart to me supported with a health awareness session on how to improve food intake and maintain a clean environment at home. Soni was quite satisfied with the treatment provided at the MNCH and she observed a significant improvement in her son’s health. Within fifteen days of the treatment, he had started walking. Soni had visited the MNCH six times in a month to ensure consistent treatment of her son through routine check-ups as advised by the medical officer. Soni told her neighbours and other women at Sadla Surjho about the MNCH and her experiences. Since then, a number of women from Sadla Surjho have visited the centre to seek treatment for viral illness treatment and antenatal and postnatal care. Some women have also taken ultrasound tests at the centre too. My son is healthy and is walking well. I strictly follow the diet as advised by the doctor for all my children to ensure their good health. I want to request the health team to establish a health center in Kot Alam union councilⁱⁱ as well so that we can have access to economical, primary healthcare services only a few minutes away from our doorsteps, concluded Soni. 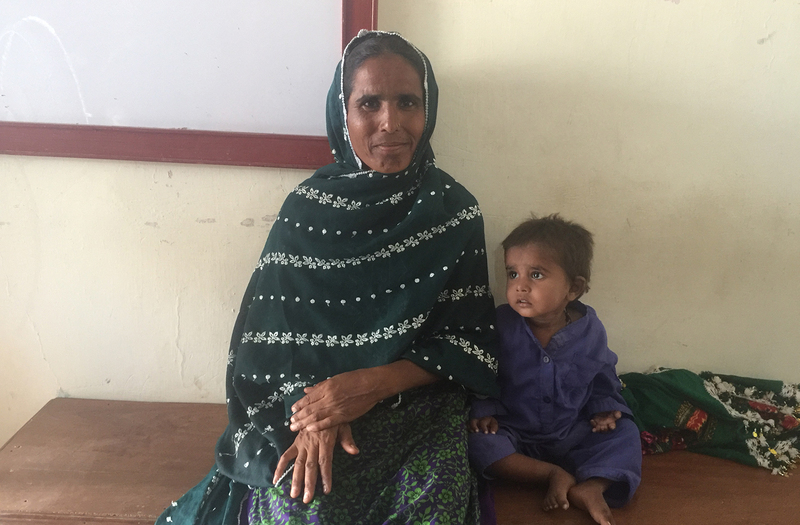 ⁱ Maternal, Neonatal and Child Health Centre Project implemented in District Thatta with the support of Church of Scotland (CoS).